"Seter" redirects here. For other uses, see Seter (disambiguation). Not to be confused with Transhumanism. A seter in Gudbrandsdal, Norway. Above the tree line in the mountains, it is used as a dwelling for those who accompany livestock to summer pasture. Traditional or fixed transhumance has occurred throughout the inhabited world, particularly Europe and western Asia. It is often important to pastoralist societies, as the dairy products of transhumance flocks and herds (milk, butter, yogurt and cheese) may form much of the diet of such populations. In many languages there are words for the higher summer pastures, and frequently these words have been used as place names: e.g. Hafod in Wales and Shieling in Scotland. The word transhumance comes from French and derives from the Latin words trans 'across' and humus 'ground'. Transhumance developed on every inhabited continent. Although there are substantial cultural and technological variations, the underlying practices for taking advantage of remote seasonal pastures are similar. Transhumance is a "form of pastoralism or nomadism". Khazanov categorizes nomadic forms of pastoralism into five groups as follows: "pure pastoral nomadism", "semi-nomadic pastoralism", "semi-sedentary pastoralism", "distant-pastures husbandry" and "seasonal transhumance". Eickelman does not make a distinction between transhumant pastoralism and seminomadism, however clearly distinguishes between nomadic pastoralism and seminomadism. In the Balkans, the Vlachs, Sarakatsani, Aromanian and Yörük peoples traditionally spent summer months in the mountains and returned to lower plains in the winter. When the area was part of the Austro-Hungary and Ottoman empires, borders between Greece, Albania, Bulgaria and the former Yugoslavia were relatively unobstructed. In summer, some groups went as far north as the Balkan Mountains, and they would spend the winter on warmer plains in the vicinity of the Aegean Sea. 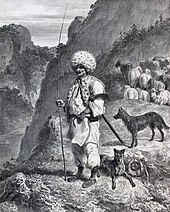 The Morlach or Karavlachs were a population of Vlach shepherds who lived in the Dinaric Alps (western Balkans in modern use), constantly migrating in search of better pastures for their sheep flocks. But as national states appeared in the area of the former Ottoman Empire, new state borders were developed that divided the summer and winter habitats of many of the pastoral groups. These prevented easy movement across borders, particularly at times of war, which have been frequent. In most parts of Wales, farm workers and sometimes the farmer would spend the summer months at a hillside summer house, or hafod (pronounced [ˈhavɔd]), where the livestock would graze. During the late autumn the farm family and workers would drive the flocks down to the valleys, and stay at the main residence or hendref ([ˈhɛndrɛv]). This system of transhumance has generally not been practised for almost a century; it continued in Snowdonia after it died out elsewhere in Wales, and remnants of the practice can still be found in rural farming communities in the region to this day. Both "Hafod" and "Hendref" survive in Wales as place names and house names. Today, cattle and sheep that summer on many hill farms are still transported to lowland winter pastures, but by truck rather than being driven overland. In many hilly and mountainous areas of Scotland, agricultural workers spent summer months in bothies or shielings (airigh in Scottish Gaelic). Major drovers' roads in the eastern part of Scotland include the Cairnamounth, Elsick Mounth and Causey Mounth. This practice has largely died out, but was practised within living memory in the Hebridean Islands and in the Scottish Highlands. Today much transhumance is carried out by truck, with upland flocks being transported under agistment to lower-lying pasture during winter. In Ireland transhumance is known as "booleying". Transhumance pastures were known as Booley, Boley, Bouley, Buaile and Boola. These names survive in many place names such as Buaile h'Anraoi in Kilcommon parish, Erris, North Mayo, where the landscape still clearly shows the layout of the rundale system of agriculture. The livestock, usually cattle, was moved from a permanent lowland village to summer pastures in the mountains. The appearance of "Summerhill" (Irish: Cnoc an tSamhraidh) in many place names also bears witness to the practice. This transfer alleviated pressure on the growing crops and provided fresh pasture for the livestock. Mentioned in the Brehon Laws, booleying dates back to the Early Medieval period or even earlier. The practice was widespread in the west of Ireland up until the time of the Second World War. Seasonal migration of workers to Scotland and England for the winter months superseded this ancient system, together with more permanent emigration to the USA. In Southern Italy, and especially in the regions of Molise, Apulia and Abruzzo, the practice of driving herds to upland pastures in summer dates from time immemorial and has enjoyed a long documented history until the 1950s and 1960s with the advent of alternative road transport. Drover's roads or tratturi, up to 100 m wide and more than 100 km long, permitted the passage and grazing of herds, principally sheep, and attracted regulation by law and the establishment of a mounted police force as far back as the 17th century. The tratturi remain public property and subject to conservation by the law protecting cultural heritage. The Molise region candidates the tratturi to the UNESCO as a world heritage. Transhumance is historically widespread throughout much of Spain particularly in the regions of Castile, Leon and Extremadura, where nomadic cattle and sheep herders travel long distances in search of greener pastures in summer and warmer climatic conditions in winter. Spanish transhumance is the origin of numerous related cultures in the Americas such as the Cowboys of the United States and the Gauchos of Argentina, Paraguay and Brazil. A network of droveways or cañadas crosses the whole peninsula, running mostly south-west to north-east (see map beside this text). They have been charted since ancient times, and classified according to width; the standard cañada is between 37,5 and 75 metres wide, with some cañadas reales or royal droveways being 800 metres wide at certain points. The land within the droveways is publicly owned and protected by law. In some high valleys of the Pyrenees and the Cantabrian Mountains, transhumant herding has been the main, or only, economic activity. Regulated passes and pasturage have been distributed among different valleys and communities according to the seasonal range of use and community jurisdiction. Unique social groups associated with the transhumant lifestyle are sometimes identified as a remnant of an older ethnic culture now surviving in isolated minorities, such as the "Pasiegos" in Cantabria, "Agotes" in Navarre, and "Vaqueiros de alzada" in Asturias. Transhumance in the Pyrenees involves relocation of livestock (cows, sheep, horses) to high mountains for summer months, because farms in the lowland are too small to support a larger herd all year round. The mountain period starts in late May or early June, and ends in early October. 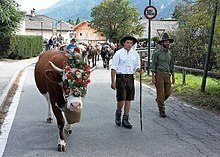 Until the 1970s, transhumance was used mainly for dairy cows, and cheese-making was an important activity in the summer months. In some regions, nearly all members of a family decamped to higher mountains with their cows, living in rudimentary stone cabins for the summer grazing season. That system, which evolved during the Middle Ages, lasted into the 20th century. It declined and broke down under pressure from industrialization, as people left the countryside for jobs in cities. The Mont Perdut / Mont Perdito region of the Pyrenees has been designated as a UNESCO World Heritage Site by virtue of its association with the transhumance system of agriculture. In Scandinavia, transhumance is still practised to a certain extent; however, livestock are transported between pastures by motorized vehicles, changing the character of the movement. The Sami people practise transhumance with reindeer by a different system than is described immediately below. The common mountain or forest pasture used for transhumance in summer is called seter or bod / bua. The same term is used for a related mountain cabin, which was used as a summer residence. In summer (usually late June), livestock is moved to a mountain farm, often quite distant from a home farm, in order to preserve meadows in valleys for producing hay. Livestock were typically tended for summer by girls and younger women, who also milked and made cheese. Bulls usually remained at the home farm. As autumn approached and grazing became in short supply, livestock are returned to a home farm. In Sweden, this system was predominantly used in Värmland, Dalarna, Härjedalen, Jämtland, Hälsingland, Medelpad and Ångermanland. The practice was common throughout most of Norway, due to its highly mountainous nature and limited areas of lowland for cultivation. "The Gudbrandsdal area includes lateral valleys such as Gausdal, Heidal, Vinstradal, and Ottadal. That area comprises lowland parishes 200 m above sea-level and mountain parishes 800 m above sea-level, fertile soil in the main valley and barren summits in Rondane and Dovrefjell. Forests surround those farms, but higher up, woods give way to a treeless mountain plateau. This is the seterfjell, or summer farm region, once of vital importance both as summer pastureland and for haymaking." While previously many farms had their own seters, today it is more usual for several farmers to share a modernized common seter (fellesseter). Most of the old seters have been left to decay or are used as recreational cabins. The name for the common mountain pasture in most Scandinavian languages derives from the Old Norse term setr. In (Norwegian) the term is sæter or seter; in (Swedish) säter. The place name appears in Sweden in several forms as Säter and Sätra, and as a suffix: -säter, -sätra, -sätt and -sättra. Those names appear extensively over Sweden with a centre in the Mälaren basin and in Östergötland. The surname "Satter" is derived from these words. In the heartland of the Swedish transhumance region, the most commonly used term is bod or bua (the word is also used for small storage houses and the like and has evolved in English as booth), in modern Standard Swedish fäbod. The oldest mention of seter in Norway is in Heimskringla Olaf II of Norway's travel through Valldal to Lesja. In the heavily forested Caucasus and Pontic mountain ranges, various peoples still practice transhumance to varying degrees. During the relatively short summer, wind from the Black Sea brings moist air up the steep valleys to supports fertile grasslands at altitudes up to 2,500 meters and a rich tundra at altitudes up to 3,500 meters. Traditionally, villages were divided in two, three or even four distinct settlements (one for each season) at different heights of a mountain slope. Much of this rural life came to an end during the first half of the 20th century, as the Kemalist and later Soviet governments tried to modernize the societies and stress urban development, rather than maintaining rural traditions. In the second half of the 20th century, migration for work from the Pontic mountains to cities in Turkey and western Europe, and from the northern Caucasus to Moscow, dramatically reduced the number of people living in transhumance. It is estimated, however, that tens of thousands of rural people still practice these traditions in villages on the northern and southwestern slopes of the Caucasus, in the lesser Caucasus in Armenia, and in the Turkish Black Sea region. Some communities continue to play out ancient migration patterns. For example, the Pontic Greeks visit the area and the monastery Sumela in the summer. Turks from cities in Europe have built a summer retreat on the former yayla grazing land. Transhumance related to sheep farming is still practised in Georgia. The shepherds with their flocks have to cross the 2,826 metre-high Abano Pass from the mountains of Tusheti to the plains of Kakheti. The Bakhtiari tribe of Iran still practised this way of life in the mid-20th century. All along the Zagros mountain range from Azerbaijan to the Arabian Sea, pastoral tribes move back and forth with their herds annually according to the seasons, between their permanent homes in the valley and one in the foothills. The Qashqai (Kashkai) are a Turkic tribe of southern Iran, who in the mid-20th century still practised transhumance. The tribe was said to have settled in ancient times in the Province of Fars, near the Persian Gulf, and by the mid-20th century lived beyond the Makran mountains. In their yearly migrations for fresh pastures, the Kashkai drove their livestock from south to north, where they lived in summer quarters, known as Yeilak, in the high mountains from April to October. They traditionally grazed their flocks on the slopes of the Kuh-è-Dinar; a group of mountains from 12,000 to 15,000 feet, part of the Zagros chain. In autumn the Kashkai broke camp, leaving the highlands to winter in warmer regions near Firuzabad, Kazerun, Jerrè, Farashband, on the banks of the River Mound. Their winter quarters were known as Qishlaq. The migration was organised and controlled by the Kashkai Chief. The tribes avoided villages and towns, such as Shiraz and Isfahan, because their large flocks, numbering seven million head, could cause serious damage. In the 1950s, the Kashkai tribes were estimated to number 400,000 people in total. There have been many social changes since that time. Examples of fixed transhumance are found in the North Governorate of Lebanon. Towns and villages located in the Qadisha valley are at an average altitude of 1,400 meters. Some settlements, like Ehden and Kfarsghab, are used during summer periods from beginning of June till mid-October. Inhabitants move in October to coastal towns situated at an average of 200 meters above sea level. The transhumance is motivated by agricultural activities (historically by the mulberry silkworm culture). The main crops in the coastal towns are olive, grape and citrus. For the mountain towns, the crops are summer fruits, mainly apples and pears. Other examples of transhumance exist in Lebanon. In Kyrgyzstan, transhumance practices, which never died out during the Soviet period, have undergone a resurgence in the difficult economic times following independence in 1991. Transhumance is integral to Kyrgyz national culture. The people use a wool felt tent, known as the yurt or jailoo, while living on these summer pastures. It is symbolised on their national flag. Those shepherds prize a fermented drink made from mare's milk, known as the kumis. A tool used in its production is the namesake for Bishkek, the country's capital city. Transhumance practices are found in temperate areas, above ≈1000 m in the Himalaya–Hindu Kush area (referred to below as Himalaya); and the cold semi-arid zone north of the Himalaya, through the Tibetan Plateau and northern China to the Eurasian Steppe. Mongolia, China, Kazakhstan, Kyrgyzstan, Bhutan, India, Nepal and Pakistan all have vestigial transhumance cultures. In Mongolia, transhumance is used to avoid livestock losses during harsh winters known as zuds. For regions of the Himalaya, transhumance still provides mainstay for several near-subsistence economies – for example, that of Zanskar in northwest India, Van Gujjars in Western Himalayas,Kham Magar in western Nepal and Gaddis of Bharmaur region of Himachal Pradesh. In some cases, the distances traveled by the people with their livestock may be great enough to qualify as nomadic pastoralism. In Australia, which has a large station (i.e., ranch) culture, stockmen provide the labor to move the herds to seasonal pastures. Transhumant grazing is an important aspect of the cultural heritage of the Australian Alps, an area of which has been included on the Australian National Heritage List. Colonists started using this region for summer grazing in the 1830s, when pasture lower down was poor. The practice continued during the 19th and 20th centuries, helping make Australia's pastoral industry viable. Transhumant grazing created a distinctive way of life that is an important part of Australia's pioneering history and culture. There are features in the area that are reminders of transhumant grazing including abandoned stockman's huts, stock yards and stock routes. The Berber people of North Africa were traditionally farmers, living in mountains relatively close to the Mediterranean coast, or oasis dwellers. However, the Tuareg and Zenaga of the southern Sahara practice nomadic transhumance. 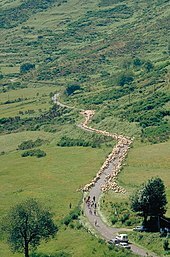 Other groups, such as the Chaouis, practised fixed transhumance. In rural areas, the Somali and Afar of Northeast Africa also traditionally practice nomadic transhumance. Their pastoralism is centered on camel husbandry, with additional sheep and goat herding. In large parts of Africa, particularly south of the Sahara, migratory herders are competing with crop farmers for resources like land and water. One example is Chad. The Pokot community are semi-nomadic pastoralists who are predominantly found in northwestern Kenya and Amudat district of Uganda. The community practices nomadic transhumance, with seasonal movement occurring between grasslands of Kenya (North Pokot sub-county) and Uganda (Amudat, Nakapiripirit and Moroto districts) (George Magak Oguna, 2014). The Maasai are semi-nomadic people located primarily in Kenya and northern Tanzania who have transhumance cultures that revolve around their cattle. In Southern Angola, several peoples, chiefly the Ovambo and part of the Nyaneka-Khumbi, have cultures that are entirely organized according to the practice of transhumance. The traditional economy of the Basotho in Lesotho is based on rearing cattle. They practise a seasonal migration between valley and high plateaus of the Maloti (basalt mountains of Lesotho). Pressure on pasture land has increased due to increases in population, as well as construction of large storage dams in these mountains to provide water to South Africa's arid industrial heartland. Growing pressure on pastures is contributing to degradation of sensitive grasslands and could contribute to sedimentation in man-made lakes. In South Africa the transhumance lifestyle of the Nama clan of the Khoikhoi continues in the Richtersveld, a montane-desert located close to the Atlantic coast in the northwestern area of the country. In this area people move seasonally (three or four times per annum) with their herds of sheep and goats. Transhumance is based on small family units, which use the same camps each year. A portable, dome tent, called a Matjieshut (Afrikaans for 'mat house') or Haru Oms (meaning 'rush house' in Nama) is a feature of Khoikhoi culture. These dwellings are used in their seasonal camps in the Richtersveld. It consists of a frame traditionally covered with rush mats. In the 21st century, the people sometimes use a variety of manufactured materials. In recognition of its significance, the Richtersveld has been designated as a UNESCO World Heritage Site. In the southern Appalachians of the United States in the 19th and early 20th centuries, settlers often pastured livestock, especially sheep, on grassy bald mountain tops where wild oats predominate. Historians have speculated that these "balds" are remnants of ancient bison grazing lands (which were possibly maintained by early Amerindians). In the absence of transhumance, these balds have been becoming covered by forest since the late 20th century. It is unclear whether efforts will be made to preserve these historic managed ecosystems. Transhumance, in most cases relying on use of public land, continues to be an important ranching practice in the western United States. In the northern areas, this tradition was based on moving herds to higher ground with the greening of highland pastures in spring and summer. These uplands are part of large public lands, often under the jurisdiction of the United States Forest Service. In the winter, herds use lowland steppe or desert, also often government land under the jurisdiction of the BLM. In California and Texas, a greater proportion of the range is held as private land, due to differing historical development of these areas. The general pattern is that in summer, ranch families, hired shepherds, or hired cowboys travel to the mountains and stay in a line camp during the summer. They may also visit the upland ranch regularly, using trailers to transport horses for use in the high country. The Navajo people began practicing transhumance in the 1850s, after they were forced out of their traditional homeland in the San Juan River valley. They maintain many sheep. In California, the home ranch tends to have more private land, largely because of the legacy of the Spanish land grant system. For this reason extensive acreages of Mediterranean oak woodlands and grasslands are stewarded by ranches whose economy depends on summer range on government land under the jurisdiction of the U.S. Forest Service. South American transhumance partially relies on "cowboy" counterparts, the gaucho of Argentina, Uruguay, Paraguay and (with the spelling "gaúcho") southern Brazil, the llanero of Venezuela, the huaso of Chile. Transhumance is currently practised at least in Argentina, Chile, Peru and Bolivia, as well as in the Brazilian Pantanal. It mainly involves movement of cattle in the Pantanal and in parts of Argentina. In the Altiplano, communities of indigenous people depend on raising camelids, especially llamas. Herds of goats are managed by transhumance in North Neuquén and South Mendoza, while sheep are more used in the Patagonian plains. Criollos and indigenous peoples use transhumant practices in areas of South America. ^ Blench, Roger (17 May 2001). 'You can't go home again' – Pastoralism in the new millennium (PDF). London: Overseas Development Institute. p. 12. ^ a b Costello, Eugene; Svensson, Eva (2018). Historical Archaeologies of Transhumance across Europe. Taylor & Francis. ISBN 978-1-351-21337-0. ^ Gwynn, Eirwen. "On the land – yesterday and today" (PDF). Retrieved 12 September 2010. ^ "History of Hafod Elwy Hall". Hafodelwyhall.co.uk. Archived from the original on 24 March 2008. Retrieved 12 September 2010. ^ McDonnell, John (1988). "The Role of Transhumance in Northern England". Northern History. 24: 1–17. doi:10.1179/nhi.1988.24.1.1. ^ Historic England. "Medieval transhumance hut on Draynes Common, 500m south-west of Westerlake Farm (1007779)". National Heritage List for England. Retrieved 11 January 2019. ^ "What are sunken lanes?". National Trust. Retrieved 11 January 2019. ^ Historic England. "Early medieval transhumance hut 740m west of Blackcoombe Farm, Linkinhorne (1011899)". National Heritage List for England. Retrieved 11 January 2019. ^ Sharkie, Brendan. "How the Irish invented Hallowe'en". Irish Culture and Customs (via Wayback Machine). Archived from the original on 23 March 2013. Retrieved 26 April 2013. ^ "summerhill". Logainm.ie. 13 April 2016. Retrieved 20 August 2016. ^ "Pyrénées - Mont Perdu". UNESCO World Heritage List. whc.unesco.org. Retrieved 26 April 2013. ^ Snorre Sturluson: Norges kongesagaer; prepared by Kjeld-Willy Hansen, John Larsen og Dyre Vaa. Libri Art 1995, s.36. ^ Chapple, Amos (October 2017). "The Mountain Shepherds". Radio Free Europe/Radio Liberty. Retrieved 29 October 2017. ^ Ullens de Schooten, Marie-Tèrése. (1956). Lords of the Mountains: Southern Persia & the Kashkai Tribe. Chatto and Windus Ltd. Reprint: The Travel Book Club. London, pp. 53–54, 114–118. ^ Duncan, A.; Rahman, A.; Miller, D.; Frutos, P.; Gordon, I.; Rehman, A.; Baig, A.; Ali, F.; Wright, I. (1 November 2006). "Transhumance livestock production in the Northern Areas of Pakistan: Nutritional inputs and productive outputs". Agriculture, Ecosystems & Environment. 117 (2–3): 195–204. doi:10.1016/j.agee.2006.04.003. ISSN 0167-8809. ^ "Australian Alps National Parks and Reserves, The Alpine Way, Thredbo Village, NSW, Australia (Place ID 105891)". Australian Heritage Database. Department of the Environment. Retrieved 12 September 2010. ^ Miankeol, Djeralar. "Herd destroy harvests". D+C. Retrieved 21 December 2015. ^ "Richtersveld Cultural and Botanical Landscape". UNESCO. Retrieved 27 December 2012. ^ Starrs, P. F. (1998). Let the Cowboy Ride. Johns Hopkins University Press. ^ "Erosion of Trust". American Scientist. doi:10.1511/2010.85.348 (inactive 12 February 2019). Retrieved 12 September 2010. ^ Sulak, A. and Huntsinger, L. (2007). "Public lands grazing in California: untapped conservation potential for private lands?" Rangelands 23(3):9–13. ^ Andaluz Westreicher, Carlos; Mérega, Juan Luis; y Palmili, Gabriel (2007). "The Economics of Pastoralism: Study on Current Practices in South America". Nomadic Peoples. 11 (2): 87. doi:10.3167/np.2007.110205. pp. 87–105. (Print), 1752–2366 (Online). Jones, Schuyler. "Transhumance Reconsidered". Journal of the Royal Anthropological Institute, London, 2005. Jones, Schuyler. Men of Influence: Social Control & Dispute Settlement in Waigal Valley, Afghanistan. Seminar Press, London & New York, 1974. Wikimedia Commons has media related to Transhumance. Look up transhumance in Wiktionary, the free dictionary.